Enjoy the outdoors and the mountain fresh air, hit a perfect shot and take in the panoramic views around Oberstaufen and the Allgäu region. You can test your game on one of the 20 courses available and here in Oberstaufen a great golfing experience is guaranteed. Between Lake Constance and the Neuschwanstein Castle lies a golfer’s Eldorado, with 9- hole, 18- hole and 27- hole courses. There are 20 facilities in total offering various levels of difficulties to tee off at. All the courses are within an hour’s drive from Oberstaufen. The fantastic alpine views stretching over 200 kilometres will help you to unwind and will inspire your game- the choice is yours. 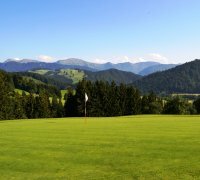 Golfing In Oberstaufen-Golfing Experiences And Leisure Enjoyment. Oberstaufen can satisfy your craving for golf. 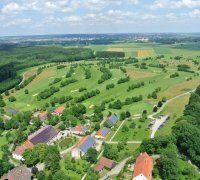 Just 1 kilometer away from Oberstaufen are an 18- hole and 9-hole course known as the Golfzentrum. The short 9-hole course boasts well-kept greens and fairways, stretching into the beautiful Schwarzbachtal valley. The 18-hole course is at the Golf Club Steibis at the foot of the impressive Hochgrat mountain. This is a course with a real challenge, even for the more experienced golfer. 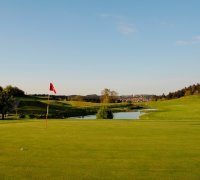 The Golf Club Waldegg-Wiggensbach has an added highlight offering the highest tee off at the height of 1000 metres. The alpine backdrop is truly amazing with views as far as the 200 kilometres away Berechtesgadener Alps. In close vicinity is the Golfpark in Riefensberg, just a10 minutes drive from Oberstaufen, situated in the Austrian Bregenz Forest. The course has been thoughtfully landscaped with man-made lakes, which fit perfectly into the picturesque surrounding nature. Numerous other clubs are offering a green fee deduction of up to 30%. 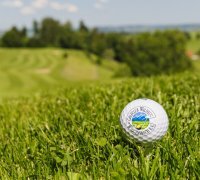 Play golf without paying for the green fee at the golf course Scheidegg: a new 9-hole course is located on the sun terrace of Scheidegg. Ingrid Swan › Hello ,my husband & I would like to come to Oberstaufen 7 play golf from 25th June-2nd July.I could not find which hotels offer the golf plus card & wondered you could give me some advice. Romina Prestel › Hi Ingrid, thank you for your message. In Oberstaufen there are many golf hotels which offer golf without paying for the green fee with your Oberstaufen Plus Golf guest card. You can find the whole list here. If there is anything else, I can do for you, please just let me know.